The Music Centre provides lessons on all instruments including drums, guitar, piano, voice, bass, saxophone, cello, violin, flute, trumpet and more. Music lessons are offered from beginner to professional. All ages, skill levels and musical disciplines. 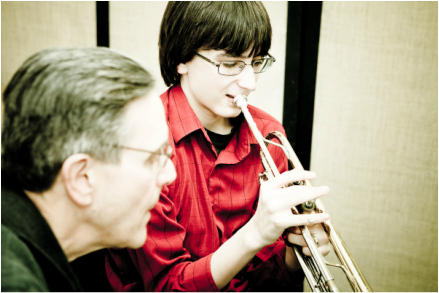 With a staff comprised of some of the finest professional working musicians in the area, our music programs offer a clear, caring and enthusiastic environment for the encouragement and nurturing of musical talents and skills. Recitals are offered in the spring and fall for all Music Centre students. Our policies are simple at The Music Centre. We try very hard to provide excellent customer service through the administrative office, and work with students and families when there is a scheduling conflict. We have no contract for length of instruction. We simply ask two weeks notice when a student wishes to stop lessons. Many of our students study with us for years. At time of registration a $25 registration fee and a two-week lesson deposit are payable, along with the lesson fees for the month. The registration fee is non-refundable and one-time, even if student stops and then returns no further registration fee will be charged. The lesson deposit pays for the last two lessons. Additional students from the same household pay a $15 registration fee, with a maximum of $45 per household no matter how many students. Any combination of more than one weekly lesson per household qualifies for an 8% discount in lesson fees. This can apply to one student taking multiple lessons, or one household with multiple students. Payment for lessons is monthly, due at the beginning of the month. If you should need to cancel a lesson we ask for 24 hours notice. The office opens at 10:30 am Monday through Thursday. Phone messages left by then will be considered sufficient notice. The front desk handles all scheduling, billing and payments, leaving our instructors free to concentrate solely on musical instruction. Please notify the desk rather than your instructor of any schedule changes. When a lesson is cancelled you will be charged for it, but we will ensure the student receives a make-up lesson. We work with you to schedule make-ups as conveniently as possible. Make-ups can be taken right before or after the regular lesson if there is an opening, for example. If a student does not come for a lesson and we have not been notified or given enough notice, the lesson will be charged for, and we will pay the instructor for the time. No make-up can be offered in this case. During the summer months students can schedule two vacation cancellations (with notice please) with no charge/no make-up. All of our instructors are working professional musicians. From time to time lessons may be cancelled for performances. Students have their choice of a credit or a make-up for instructor-cancelled lessons. Weather cancellations: The Music Centre will close only if hazardous road conditions exist. Every effort will be made to give students timely notice in the event of weather cancellations. Students have their choice of a credit or a make-up for lessons cancelled due to weather.